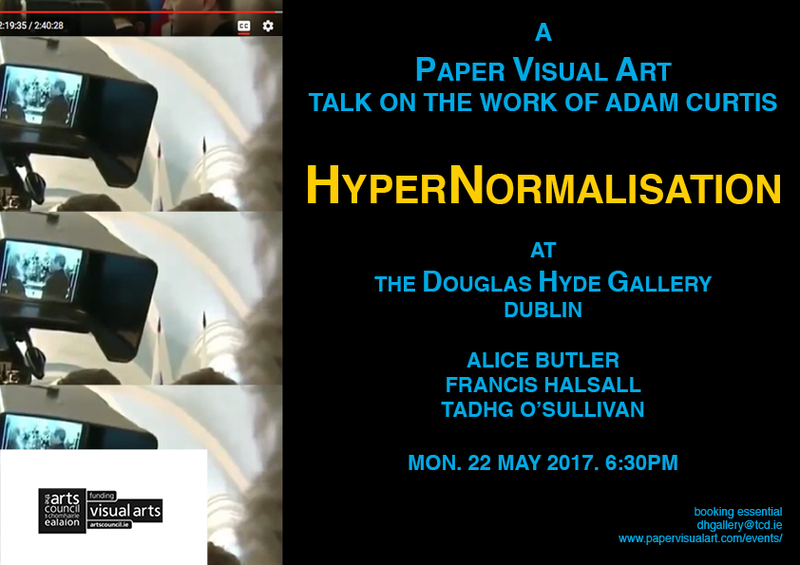 Paper Visual Art Journal will host an event at the Douglas Hyde Gallery, Dublin, to discuss some elements of the recent work by British filmmaker Adam Curtis, particularly his 2016 essay-film Hypernormalisation. We have invited Alice Butler of the Irish Film Institute, Francis Halsall of the National College of Art and Design, Dublin, and independent filmmaker Tadhg O’Sullivan (The Great Wall) to contribute to this discussion. The major focus of the talk will be the content and form of Curtis’s argumentation in this film and how this form of argumentation has evolved from earlier works. An audio recording of the conversation will be made available on the PVA website subsequently.